Next to Obwocha’s blue house with red clay tiles on the roof, there is a shed made of tall green corrugated iron sheet walls surrounded by twisted barbed wire. Half the shed is roofed with the same green corrugated iron sheet. The other half is an open space that lets in sunshine, rain, and wind with the pieces of outdoor debris that it carries. We do not know how many dogs live inside the shed but over the years we hear Obwocha mimic the gentle puppy cries that mature into deep and low-pitched barks, more beast than doglike. We estimate how big these dogs are. We have never seen them. They are noisy. It’s a never-ending barking face-off. Barking is what our normal dogs do. Behind the green walls we hear echoes of something loud; it scratches our hearts, it booms and goes on unceasing. We constantly shift between staying away and being close enough to hear all of it. We anticipate the startled newcomer’s unhurried drive or walk along that road until the noise invites them into our reality. Then, we laugh. Obwocha’s flat forehead has been a fixture at the supermarket, at the butchery and now at the nearest slaughterhouse. He sprints from his parked car, always bothered about the quality of meat for his canine family. All we ever see, as he does not need a concrete fence like us, is that these dogs consume more mutton, beef and maybe even more donkey meat than we cook for our annual neighborhood end-of-year party. We assume that he will apply for a wildlife-hunting license so that he can forage at the game reserve for duikers, wildebeests, warthogs and hyenas to supplement the dog diet. Hyenas! Laughter everywhere. Obwocha’s employee, Don the gardener-caretaker-cook, chops meat on an old log. Always, Don dresses in the same stained coat, patches of old and new blood. Just before sunset, grunting sounds accompany the tak tak tak of the axe meeting the wood below the meat. Thereafter we hear chunks of meat dropping into plastic feed buckets. Obwocha arrives in his car with fresh meat for the next day. Obwocha, firm handshake and smile, greets the aproned Don who opens the gate. Obwocha goes straight to the house, never stops to admire the trimmed kei apple hedges, the red Nandi flame petals or to pick up the fallen avocados. He takes large strides as Don pants behind with crates of meat to be refrigerated. Inside the house, he complains. “The kei apple hedges are still uneven, can’t you see?” Don mumbles. Obwocha exchanges his office coat for the stained and slightly ripped apron that Don stores for him. 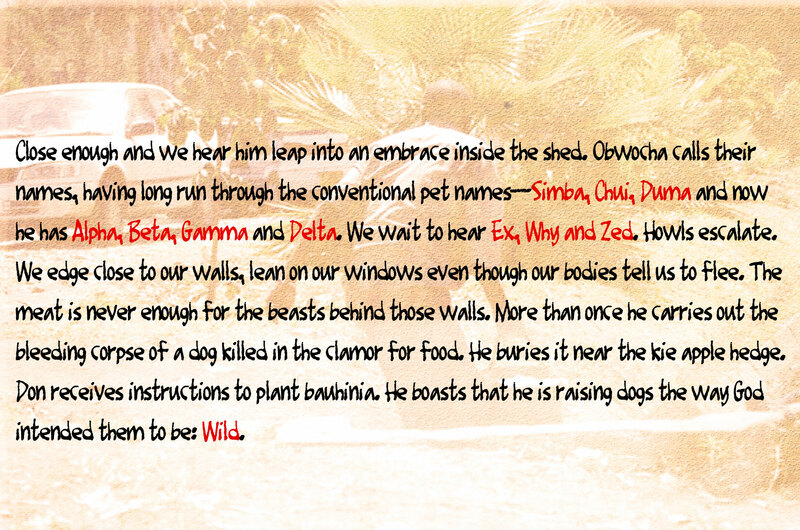 Obwocha trots out of the house, follows the scent of bleeding flesh and his dogs. He smiles as one would at the sight of a long lost friend. Close enough and we hear him leap into an embrace inside the shed. Obwocha calls their names, having long run through the conventional pet names—Simba, Chui, Duma and now he has Alpha, Beta, Gamma and Delta. We wait to hear Ex, Why and Zed. Howls escalate. We edge close to our walls, lean on our windows even though our bodies tell us to flee. The meat is never enough for the beasts behind those walls. More than once he carries out the bleeding corpse of a dog killed in the clamor for food. He buries it near the kei apple hedge. Don receives instructions to plant bauhinia. He boasts that he is raising dogs the way God intended them to be: Wild. Obwacha has to travel far away from home, to Kitale, for business. All the way to Kitale is seven hours away. This has happened before. He expects to return after a day. For one day, the dogs will not eat. Nobody else can feed them. “This has happened before.” He tells Don. He feeds them twice as much as usual on Monday and leaves early the following morning to catch the bus to Kitale. Don gets the day off. The dogs make their scary dog noises. Don is away all day, lingering around his friends’ workspaces in his orange armpit-stained blue shirt and his wrinkled grey trouser. No apron. At feeding time nobody drives home. The dogs—they roar, they gnash teeth, squeal, they wrestle, howl, they do not sleep. We stuff rags into our ventilation passages above our doors and windows to block out the noise. We do not sleep. In Kitale, Obwocha finds more work than expected. He exceeds his twenty-four hour deadline. He has to spend three days away from his much loved animals. Don’s Nokia rings in the morning just as he gets to work. He blocks one ear (so much noise) and listens to his boss. “Even babies can survive three days without food,” Obwocha says. “Pardon? Are you sure?” Don asks. “I know what I am doing,” Obwocha snarls. “Okay.” Don breathes. Don leaves. Two nights pass. The shed rattles. Our houses empty at night, some of us cannot sleep here. Obwocha’s compound is littered with drying leaves and petals, but these will wait just like the dogs. On Thursday, Obwocha returns from the slaughterhouse with an extra load of food. Don resurfaces. Tak tak tak the axe has so much to break. Obwocha rolls up his sleeve and helps. Obwocha calls the dogs from outside the shed. They whine. He lines up the meat-filled buckets outside the shed before stepping in with just two. He speaks slow and gentle, tossing chunks of meat in different directions. The dogs scurry, jump and wrestle. He does not come out for more meat. Instead they eat all of him: skull, foreface and cheeks. They rupture his veins, tear his hide, cut into his flesh, crush his bones and scratch the hair off his head. They swallow.